‘Zinn’ is an old dialect word for tin - the mines on Dartmoor are abandoned and the tin port on the Avon estuary is long forgotten. Zinn thinks about human, geological and film time. We remember the beach from our past visits and can return, but what we see is always different. 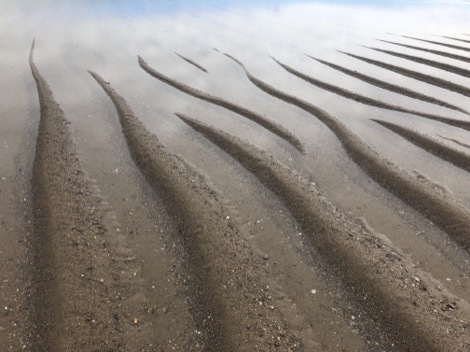 The estuary is constant, but changing - its sand patterns caused by the waves, tides, winds and the flow of the river as it reaches the sea from its source high on the granite mass of the moor. 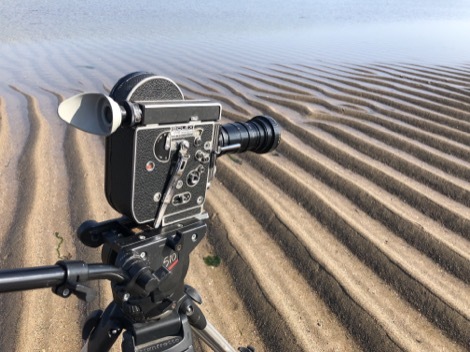 Zinn is a creative exploration of the temporalities and affects of deep time, in which the film-maker responded intuitively to the location at low tide one summer afternoon. The 16mm clockwork Bolex camera became a sensory extension of his body, capturing on film his intuitive response to his embodied experience of the particular landscape of the estuarine beach as the tide came in, its sands shaped by cycles of sedimentation and erosion, a process of lifting up then grinding down the rocks of nearby Dartmoor over many millions of years. The sound design uses sonified data from the Large Hadron Collider to imagine the deep time processes taking place within the mantle of Dartmoor, with deep resonant bass undertones suggesting geological infrasound. The Meteor film pod on tour around Cornwall: Zinn and the other commissioned short films screened in the portable film environment sculpture at the Secondary Schools STEM fair, the Royal Cornwall Showground (supported by Cornwall Council and Feast); Pensans and Nancealverne Schools, Penzance (supported by local Cornwall Councillor Tim Dwelly's Community Chest Fund); Mullion School; and Lizard Point YHA (March 2019).